Do you want to light up your life beautifully, and create that flawless look with those white cool bulbs you’ve been seeing everywhere? 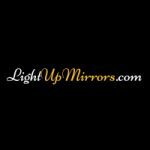 If you want that Hollywood feel then you’re in the right place, because this is a step by step guide on how to set up your own stunning Vanity Makeup Mirror with lights. 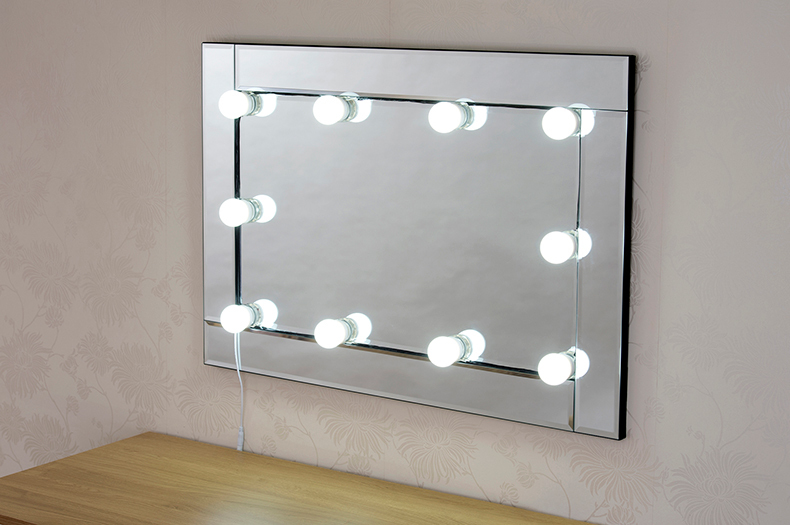 Buy the Samms Hollywood style LED lights mirror Kit to start your DIY Hollywood Light bulb mirror. 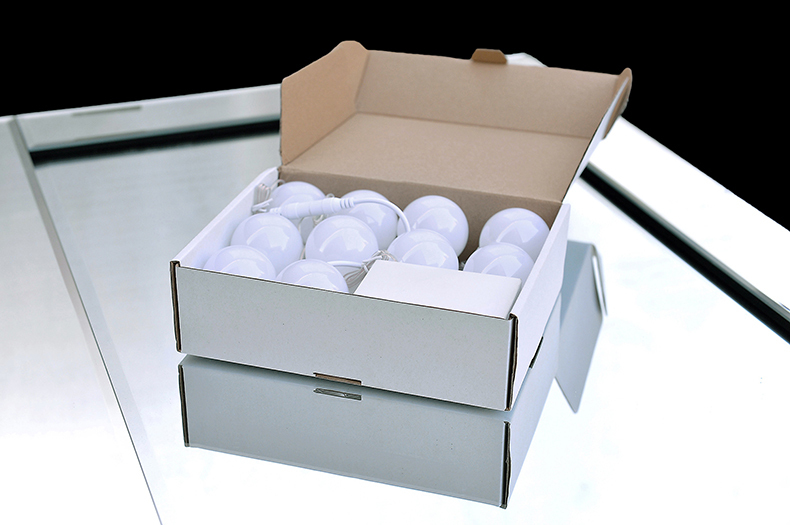 The kit is 12.5ft in length and consists of 10 high quality cool white bulbs. These give off a soft glow, creating flawless lighting to help you perfect your hair, apply your makeup or take great quality photos while helping make you feel like a star. The Vanity light kit has got 10 Dimmable LED light bulbs and comes with a dimmer switch so you can adjust the brightness to your desired level and improve your quality of lighting no matter the time of day. You can choose to buy a mirror or use an existing one, such as your dressing table mirror. Whether it is a table top mirror, wall mirror or free standing mirror it doesn’t matter, your options are not limited. Please note: if you choose a heavy wall-mounted mirror you should seek assistance on which brackets to use to make sure the mirror will be properly secured. 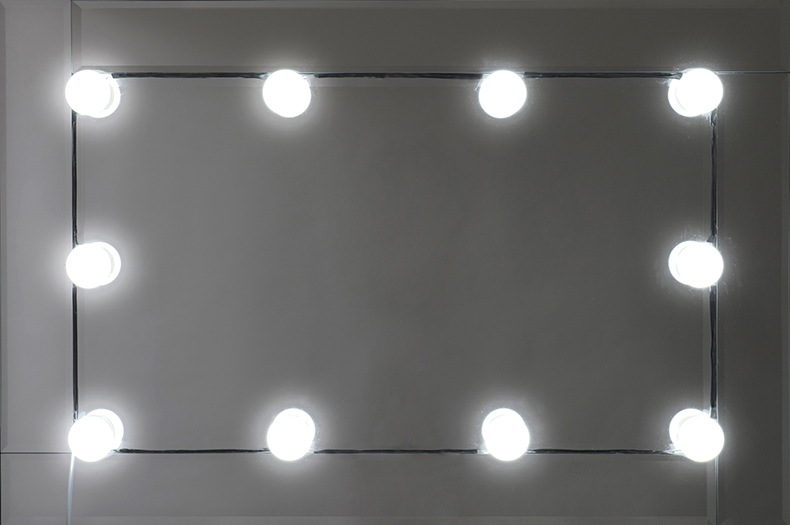 Place your mirror on a flat surface with the mirror facing upwards, position the bulbs on the mirror without sticking them and ensure that they are evenly spaced out. When you’re happy with the arrangement of the bulbs and have checked that the positioning is to your liking, one bulb at a time start to tidy any loose or excess wire by wrapping around the base of the bulb. Repeat this wrapping process for all 10 LED Vanity light bulbs. 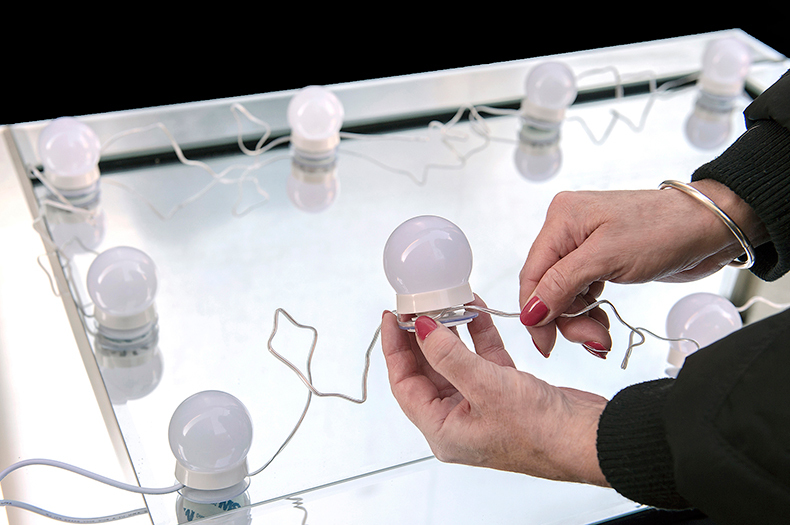 Now you have all the bulbs in place and all the excess wires are nicely tucked away lift one bulb at a time and peel the sticker from the base of the bulb and stick it back in its chosen place. Gently press the bulb down and hold for a few seconds, do this for all 10 LED bulbs. Place your mirror in the desired location, such as the wall or on your dressing table, and connect the power supply connector to the dimmer switch, and the dimmer switch to the bulb wire connector, then plug the 3 pin connector into the wall socket. Your lights will power on and you can control the brightness by using the dimmer switch. And there you have it! You have transformed your space with a touch of Hollywood glamour and made a style statement by creating a glamorous Hollywood mirror for only £39.99.